THE alarm bells were ringing. Here we go – the AFL is entering the unwanted world of the NRL where players commit to rival clubs before even finishing up a season with their current. It simply hasn’t been the “done thing” in our competition. Well, at least a player getting caught out doing it anyway. But when it was discovered Bulldogs midfielder Lin Jong had secretly toured the facilities at Collingwood last week, it set tongues wagging. He was apparently only looking, and not touching (any official paperwork from the Magpies), but it probably still felt like cheating to the Dogs faithful. Of course, there’s always talks being had behind closed doors – between players and managers, and managers and clubs – but by and large supporters are shielded from it. Geelong fans suspected Gary Ablett might shift to the Gold Coast; Hawthorn supporters thought Buddy Franklin would probably head to Sydney (most likely GWS and not the Swans). They were right, but the players’ decisions were never revealed and contracts signed until seasons’ end, and fans were able to carry on cheering for “their player”. AFL Players’ Association chief executive Paul Marsh told media yesterday it was time, however, for the competition to grow up. “We need to be mature enough as industry to get to that point – and we’d get used to it,” he said. There to meet Jong, Magpies coach Nathan Buckley, understandably, was also supportive of such in-season get-togethers. “It happens, and it’s happened consistently,” he said. But Melbourne counterpart Paul Roos, who spent years in Sydney watching the goings-on in the NRL from close range, is from the old school. “I think clubs are aware that discussions are going on with managers, probably even players, (and) I think if you’re out of contract you have a right to sort of work out where you go,” he said. But he was firm in his stance that he “wouldn’t bring a player here to the Melbourne Football Club with eight to nine rounds to go”. And you can’t help wonder about the reception Jong will get from the Bulldogs faithful now they know he’s been cavorting with the enemy. That’s if he’s even played by Dogs coach Luke Beveridge. 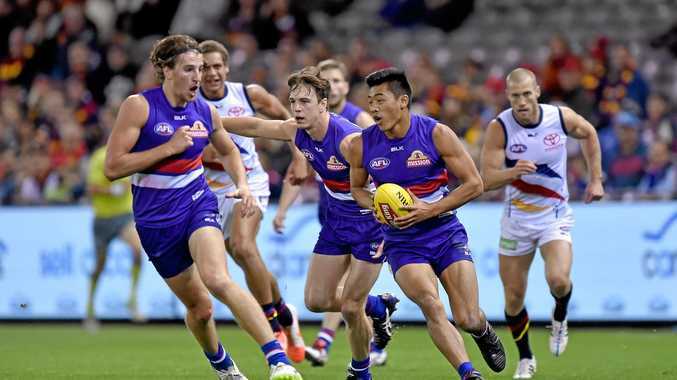 Certainly Mick Malthouse made it clear yesterday if he was in charge, Jong wouldn’t be. “Trust is the mortar and if that starts to fray because a player can’t cop what he sees in front of him and he can’t wait until the end of the year, then I wouldn’t play him,” he said.